Old body style 7.3 diesel based Ford heavy duty trucks have always been known for their reliability and longevity. Unfortunately, they have always lacked a bit in the ride quality department. When these trucks were newer and suspension manufacturers offered a variety of products for them, the focus was generally always on lift height rather than ride quality. 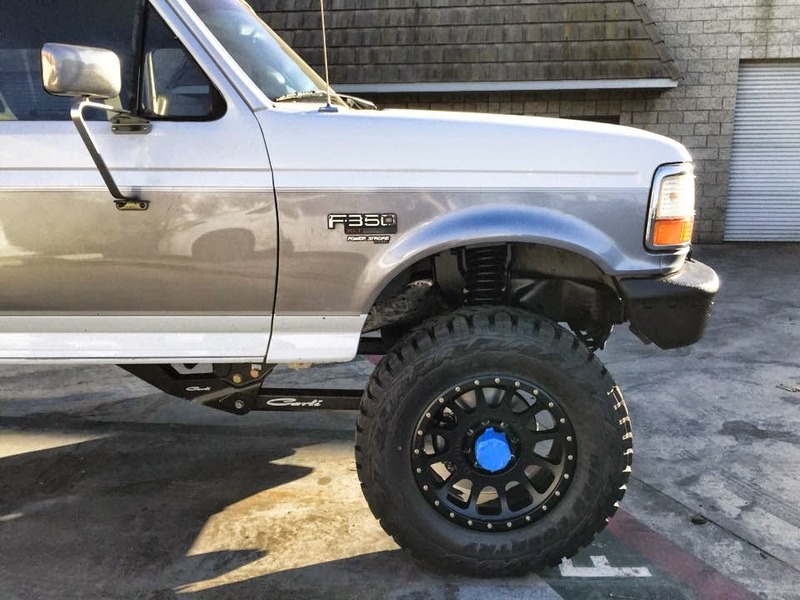 After perusing Carli Suspension's options for the 2005+ Ford F250/F350 Super Duties, a local customer had an idea - why not combine the reliability and timeless looks of his 1997 F350 with the ride quality and off road performance that Carli Suspension products offer for the 2005+ trucks? We did some research and realized that some had already converted their old body style trucks to 2005+ radius arm suspension, with most of them using stock components. With frame widths being very similar, our curiosity was piqued. Carli Suspension's Ford Dominator 3.0 kit uses complete new coil buckets and rear leaf springs, while Carli also offers fabricated radius arms. Rather than utilize stock 2005+ components like many of the builds we had seen, why not upgrade everything? We will be posting more updates here on this blog as this build progresses! First we stripped the factory front suspension and steering components. We then mocked up positioning of the radius arm brackets. Once the radius arm brackets were measured and calculated as in the correct position, we mocked up the Carli Suspension coil buckets to get a rough idea of where they will sit in relation to the front axle. We then tested clearance of the King 3.0 shocks that are included in the Carli Dominator system to ensure clearance. With the passenger side bucket mounted, we will move onto the driver side. The driver side is a bit more complicated as the track bar bracket must also be mounted. For more information about Carli's Ford Dominator 3.0 system, click here. To se updated pictures of this build, click here! What did you do for a track bar bracket/ mount?.